Bruce, Julian, and Rob host board game designer Martin Wallace to ask him that timeless question, “How awesome is your game?” The crew discuss A Few Acres of Snow, the card-based board wargame that has consumed their lives, and dissect how it handles its subject: The French and Indian War. Martin explains why a game about 18th-century colonial warfare was originally conceptualized as a game about interstellar warfare. How does Martin approach his various subjects, and why does he think that is distinct from how most wargames are designed? This was a great conversation, and I haven’t even had the pleasure of playing Few Acres of Snow. Bruce was surprisingly calm— wait, did he just say he’s going to be working for ABC NEWS?!? Interesting comments regarding issues converting a board game to digital. While online board game sites are an option to finding opponents, they are not well known, and have a limited selection of games. With the perpetual issues with finding opponents, board game authors are limiting there audience significantly if they don’t offer a digital version of their work. One of the great boardgame designers; few others manage to blend wargame mechanics and abstract game mechanics as effectively as Wallace does. Sad to see no mention of my favorite MW game: “Struggle of Empires”. I am happy to hear Mister Wallace is coming up with other settings for this system. I really enjoy the mechanic, and would love to see it applied to other conflicts/scenarios. Awesome show. As someone who had never played the game, though, I would love it if you could spend 5 minutes talking about the core mechanics at the beginning of the show before asking questions like “how did you come up with the idea?” Eventually enough was revealed that I understood the game, but it took a while. Excellent show, I’d have liked to hear some of Troy’s comments on the game also, but it was a real treat to hear the designer of the game comment it’s qualities and where the inspiration come from. I’ve been enchanted by the game since Bruce mentioned it on Quarter to Three. 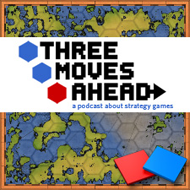 It’s sort of my dream boardgame, it combines interesting and exploratory gameplay, with fairly straight forward mechanics, and key decisions all wrapped up in a theme that entices wargamers and strategy gamers alike. Having a conflict worthy of looking into, portrayed and exemplified by the games mechanics is just a real treat. I could play the game over and over again, eeking out nuances and subtleties and just simply enjoying the history behind it. Comparing the mechanics with the actual historical outcome. I’ve been playing Bruce over at Yucata, and thoroughly enjoying my time, even though I’ve not quite honed my own skills enough to look ahead into the discard and draw piles to concoct an overarching strategy. I’m mainly playing the game by reacting to the drops in my hand, but I feel every game I play, I learn some new aspect, and I want to play more games to try out different tactics. Just playing against Bruce gives you some insight into what is important, and because the two sides play SO differently, theres a whole other level of playtime set aside to try out the French harrassing tactics. I wish more boardgames set themselves deep in historical military events – instead of centering upon betting, buying and or running fantasy economies. Very few online boardgames cover wars of any sort. Anyway, I’m eager to see where the designer is going to take the mechanic, if it goes into a series. And I’d just like to thank him for delivering such an replayable entertaining game that melds history, wargaming and strategy gaming into a boardgame. Top stuff! I’m so happy Bruce asked that question about God’s Playground. I know almost nothing about the game, but I loved where the answer took things for a bit. That was just so wonderful. Great podcast. I plan on picking up this game when they release the second edition. In terms of Historical info I’d have to disagree with calling “Braddock’s defeat” an ambush. It was anything but that. Actually both forces collieded with one another in what could be considered a meeting engagement. Hopefully Mr. Wallace will be back on the show to discuss the 2nd edition of A Few Acres of Snow. Wait, so this was initially a space game and then Mr. Wallace made it about some boring war no one ever heard of where you can’t even play as America? FAIL! And, yeah, hurry up with the next print run so I can get a copy! I’ll just pretend the French are Romulans and that forts are starbases. God’s Playground sounds like the coolest game in the world! 200 zlotych(?) is like USD60 I guess, which is not that crazy for a board game, but I am daunted by the logistics of ordering it from Poland. Also I am starting to have more games than people to play them with. Just as I started thinking that you didn’t actually have Martin on the show he chimes in. Good stuff.